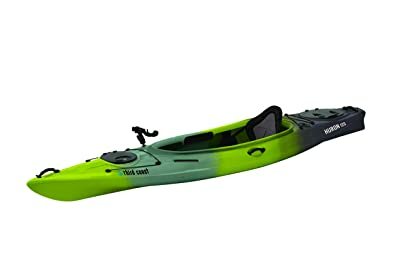 12 Best Fishing Kayak Reviews 2019 - Sit-On-Top or Sit-In? Tired of fishing from shore and wishing you were out on the water? A kayak may be the right choice. Kayaks are environmentally friendly, healthy, and generally less expensive than motorized boats. 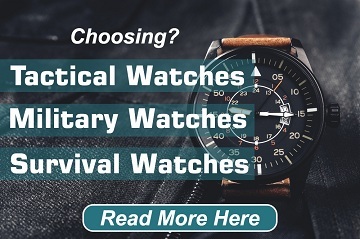 But there are so many options out there that it’s hard to know what the differences are, let alone which model to buy. 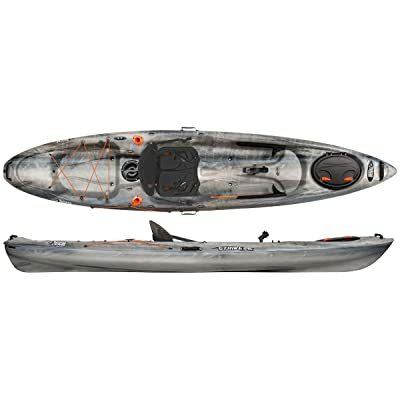 Our fishing kayak buying guide below will help you learn what to look for in the best fishing kayak for you, and the following reviews outline the features of each model. 3.0.1 I’ve never kayaked before. Can I fish from a kayak? 3.0.2 What if I tip over? 3.0.3 But I can’t swim! 3.0.4 Don’t big fish pull you? 3.0.6 Where do you put the fish you catch? 3.0.7 Should I buy a tandem? 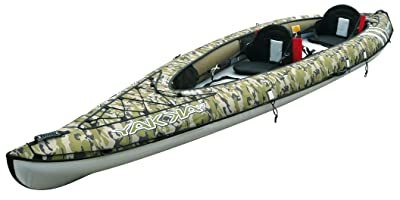 3.0.8 How can I test a kayak I’m interested in? 3.0.9 How can I get started with kayak fishing? 3.0.10 Are there other options than the ones reviewed here? What makes a Kayak the best? It has to be stable, track well, be comfortable enough to go all day, glide easily through the water, and have the amenities to take it above the run of the mill boats. It’s no easy task! As a general rule, a boat that tracks well isn’t that stable. But in this case, Ocean Kayaks nailed it all. Ocean Kayak has been making kayaks for a long time and the Prowler Big Game is several generations old. You can tell they put in the time and effort to learn from their past and make a solid fishing platform capable of getting you to the fish quickly and with enough comfort to stay all day. Above all, the Prowler Big Game is stable. Super stable. Stand up and fly fish stable. But it still tracks well and you can get enough speed not to get stranded in moving water. It comes with a storage hatch in the bow and a spacious hatch in the center to keep everything you may need while on the water. There are two rod holders molded in and six accessory plates for mounting more. It even comes with a scupper that is designed to be compatible with your fishfinder’s transducer. With a little time, you can turn this boat into a beast of a fishing kayak. Hobie has been widely recognized for years as the kayak that can get you to the fish with plenty of energy for a long day of casting. The Mirage was one of their first kayaks made just for fishing and with years of polish, this kayak is still one of the best on the market. With Hobie’s MirageDrive technology, you don’t need a paddle to get where you are going and unlike traditional peddled boats, you generate power with both the push and pull stroke. This is perhaps the best kayak ever made for trolling and is an all-around solid kayak for any type of fishing. In addition to the drive mechanism, this boat has a ton of under deck storage and a rail system with enough room to mount anything you may want to mount. The chair is super comfortable all day. The Mirage tracks with best of them and is easily stable enough to stand up and cast. Just like the prowler, this is a roomy boat with great features. The only thing that knocks it out of the number 1 spot is the price. Feel Free is a newer name on the market but have taken it by storm! They have made a huge name for themselves in kayak fishing competitions and with anglers around the country. It’s easy to see why with Lure series. They track smooth and run fast while being plenty stable. It may not be the best for stand up casting but with a little practice, it works just fine. The Lure is an all-around great kayak with great features. The front tank well is more accessible than most kayaks and features a built-in cutting board. There is a very spacious console, molded in rod holders, and plenty of attachment points for any other gear you may need. Feel Free’s removable fishing pod makes installation and storage of your fishfinder a breeze. And I cannot fail to mention their seat which is perhaps the most comfortable ever mounted in a kayak! New companies come into the market with the competition on their mind. They have something to prove. Feel Free has proven it can run with the big dogs with a fully featured kayak and for a price that can get most anyone on the water. This is a company to watch and a kayak that is a definite contender! Designing a kayak isn’t the easiest of tasks, designing one to hold two people is even harder. You can’t just scale up a normal kayak and stick in a second seat if you want to end up with a stable boat. For a fishing kayak, that second person in the boat makes storage a lot more difficult to deal with. Despite the difficulty, Jackson Kayak took on the challenge with great success! The Kilroy DT is one of the finest tandem kayaks made. Special care was taken in the hull design and layout of attachment points and storage to allow for that second person. The boat is wider but tapers more sharply than a standard kayak design. Even loaded with two people and gear, it’s a very stable kayak that tracks well. In order to be a good fishing kayak, you need places for your gear. The Kilroy DT has plenty! With a rear hatch, full length attachment rails, and waterproof storage on each seat, you can have plenty of gear at hand. The seats are comfortable and can be removed to turn this kayak into a one man show if no friends are present. No matter how you use it, this is a good kayak all around. Old Town started making canoes probably around the same time that Noah started building the Arc. They came early to the kayak market and were there at the inception of kayaks specifically bred for fishing. They have never gone over the top on a product but have produced consistently good products every time. Unlike a lot of kayaks, the Predator has a deep hull. Even with their slightly elevated seat, this is a super stable kayak when moving or sitting still. It’s also quite spacious with all of the storage you could need including a large center console and bow storage hatch. Everything is as customizable as can be with plenty of locations for rod holders or any other gear. And it comes ready for your Humminbird fishfinder. Old Town kayaks have a reputation for being built like a rock! Heavy but stable and near indestructible. The Predator is no exception. Standing and casting is no problem. You could probably dance on this kayak without a worry. Next to the Big Game II, this may be the most stable kayak on the market. It almost seems that the old style sit in kayaks have gone the way of the dodo, especially for kayaks geared toward fishermen. If you do find a traditional fishing kayak, it’s often made cheaply and does a very poor job. But one company hasn’t given up on kayaking’s historic beginnings. Third Coast still produces kayaks like those of years past that do their job well and are good quality for the price. 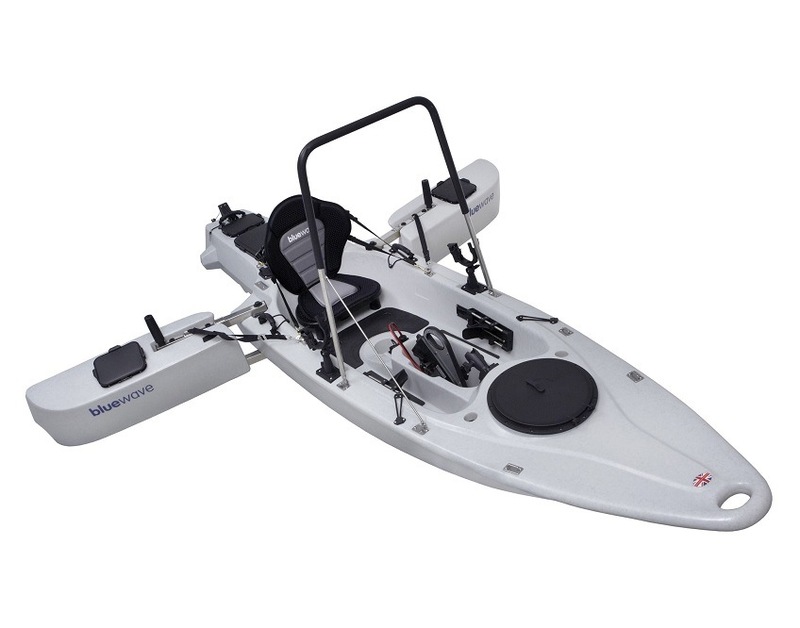 The Huron 120 has borrowed a lot of the most successful features from modern Sit-On style kayaks. It has front and rear storage hatches, molded in rod holders, and front accessory rails. The overall body shape is also reminiscent of some of today’s most modern kayaks. The seating in the Huron isn’t bad. You may not be able to sit in it all day but with a break here and there, you can get a lot of fishing done. Tracking is top notch, even with the wider body the boat sits well in the water and glides easily. If you have a need to keep dry or just prefer the old style kayaks, you could do a lot worse than one made by Third Coast. With all of this competition, what could a 5 year old company do to have a chance? Produce a product that attempts to blend some of the best features of some of the big names but at a price hundreds less. That is exactly what Vibe has done with their excellent line of Sea Ghost kayaks. Sometimes it’s not about innovation. Kayaks have progressed about as far as you can. Sometimes you just borrow what is proven, put a little personal spin on it, and make one hell of a kayak. It may not be as stable as the Old Town or as fast as Hobie but it is a good split between the two. It’s plenty stable and with its toe controlled rudder, it will track with the best of them. The Sea Ghost has all of the features of the big dogs, rod holders and mounting points, bow hatch and console. It’s just a little less refined and maybe a little less durable. The seat is top notch and plenty comfortable for hours on the water. If you are willing to go out on a limb and take a chance with a new company, you should be happy with Vibe’s Sea Ghost! The main problem with an inflatable kayak is the lack of a defined hull shape makes them feel more like you are paddling a log than a proper boat. When you add weight, the bottom sags and it almost feels like you are just sitting still no matter how hard you paddle. For a fishing platform, inflatables have always been problematic. Who could have guessed that a company known for its lighters and pens could developed the most innovative inflatable kayak on the market? The Yakkair is probably the best you could get in an inflatable and is one of a very few designed for fishing. It has rod holders, some small amount of storage, and when you are transporting it, folds into a backpack for easy carrying. For those without the means to get a full size kayak to the water, this is your answer! No matter what they advertise, this is not as maneuverable as a standard kayak but it does maneuver and track quite well. Thanks to its semi-rigid bottom, it’s quite stable. Though meant for two people, leave out a seat and you have a decent boat for solo expeditions. All in all, this is a solid kayak that even outperforms some of the cheaper hard body kayaks. Bonafide hit the market with a very small selection of fishing kayaks. They didn’t bother designing kayaks for any other activity than fishing. That’s all they worked toward and all they needed. And they did a pretty damn good job at it! The SS107 feels big and feels stable even at its small 10’ size. Its body is solid and robust but most everything else feels a little cheap. The front hatch and console are not what you would expect on a kayak costing better than a grand. It also handles a bit like a barge. Still, if what you want is a solid, dependable boat for small water, Bonafide is a good choice. It’s comfortable and a very stable platform for fishing as long as you aren’t going far. Its unique shape handles rougher water surprisingly well but I wouldn’t want to try to battle surf without better tracking. For a first timer or occasional user, this is an adequate choice. Sometimes the hardest part about kayak fishing is affording a kayak, especially if you are in the market for a full-featured kayak. Sun Dolphin has a less than great reputation with its cheaper kayaks sold at big box stores but the Boss SS is a solid attempt at a proper kayak. 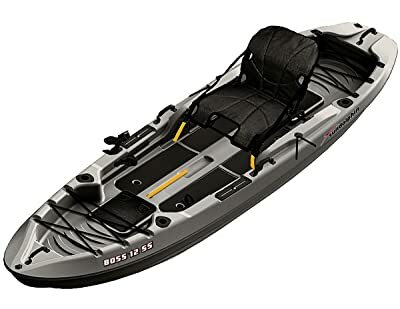 The Boss SS is a very comfortable kayak unlike the big box models and is surprisingly stable, even with a heavier load. It has a front storage well but not one that is very roomy. There is plenty of on-deck storage but for anything you want to keep below, it better be compact. It does come with two molded-in rod holders and a single swivel holder which is quite nice for the price. Tracking is something this kayak doesn’t do great. It has a lot of wiggle with its catamaran design and rounded nose with no noticeable bow for cutting through water. 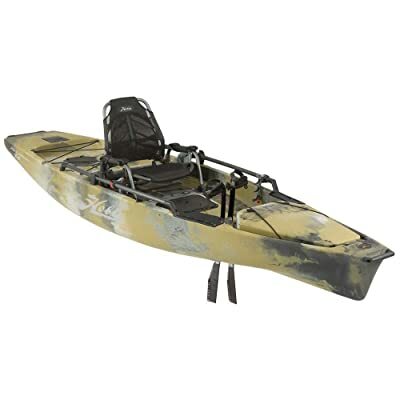 But if you are new or aren’t going far, this is a decent kayak to get a start in the hobby. The primary job of any boat, even a budget one, is to keep the people on one side and the water on the other. It helps a lot if the boat sails well and has a bit of comfort. That is sort of the starting point with most budget kayaks but Pelican Sport has gone a little further in their budget kayak line. Sure, you won’t find much in the way of creature comforts, great features, or rugged durability but you will get a boat that glides through the water fairly easy and is, all in all, quite stable. I wouldn’t want to stand and cast but I feel pretty comfortable casting while sitting. It has one standard mount rod holder, two flush mounted holders, and a front hatch. That about rounds out the standard features. What this boat doesn’t have is a comfortable seat. I am sure younger people with healthy spines would do well but for those of us with a little back trouble, a better seat is preferred. The Strike also has a thinner plastic hull. It feels a little cheap and in rough water, it almost feels like it flexes. It isn’t the most comfortable but it is quite capable. 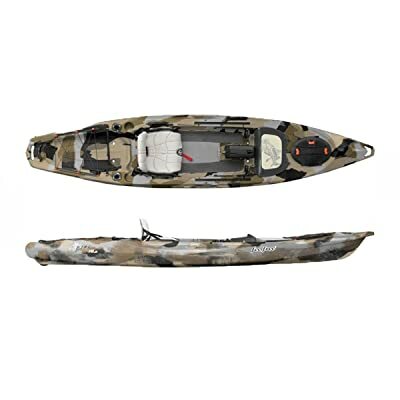 If this is what fits your budget, it’s a worthy kayak to get you out and fishing. Not just satisfied with adding a motor, the Wind Walker also has a ton of unique features and plenty of standard ones. You have a somewhat spacious bow hatch, small center console, and plenty of rod holders. The seat is comfortable and doesn’t sit too low. The back end does the splits for a lot of stability and with the stand-up bar, moving around in this boat is a non-issue. 1. 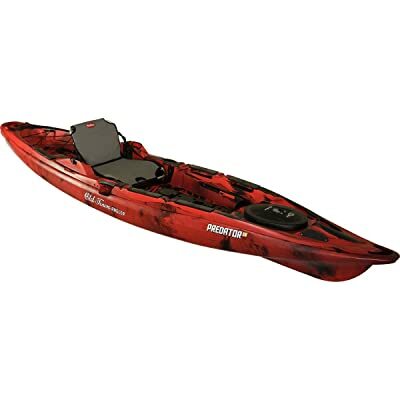 Design – All but one of the fishing kayaks we’re reviewing are sit-on-top (SOT) kayaks, not sit-inside (SINK) boats. They shed water easily through holes called scuppers and allow for more flexibility with storage space and body position. In other words, they’re made for fishing. You might get wet from water coming up through the scuppers, especially if your weight is close to the boat’s maximum capacity. You can also buy or make scupper plugs. 2. Comfort – More comfortable kayaks will have adjustable footrests. The seat(s) won’t simply be a cushion or molded plastic, and it will be elevated off the hull to avoid sitting in the water that comes up through the scuppers. Many boats have removable seats, meaning you can exchange them for more comfortable ones. For the molded plastic seats, add a cushion or two. You’ll thank us later. 3. Stability – The more you’re going to stand in your kayak, the more stable boat you want. A good indicator of stability is the width, although the boat’s design also contributes to stability. For fishing offshore or in high winds, you may need a large boat or an outrigger. 4. Tracking – Longer, thinner boats move faster and track better, that is, they more easily stay in line rather than spinning in a circle. Some boats come with a rudder, while others have a keel or skeg, which are fins that extend into the water below the boat and help it track straight and maintain stability. 5. 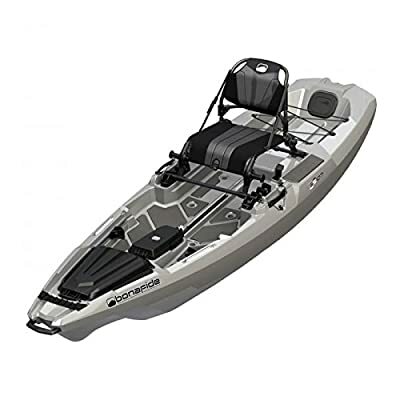 Fishing Accessories – Kayaks rigged for fishing come with rod holders (“cupholder” flush mounts and swiveling deck mounts), anchor systems for attaching coolers and live wells, and even mounts for GPS receivers and fish finders. Watch that the fishing gear doesn’t get in the way of paddling, and that it’s mounted in an accessible place. 6. Storage – Higher-end boats have quality above-deck shock cord rigging and plenty of anchor points for tackle systems and coolers, as well as large, sealed dry-storage compartments. Maximum weight capacities range from 250 to 500 lbs. If you weigh more than 200 lbs or plan to carry live bait or a lot of gear, perhaps on a multi-day trip, look for a larger boat with a high maximum capacity. 7. Propulsion – The age-old debate: paddle versus pedal. Pedal propulsion systems keep your hands free for fishing and steering, and they keep a shorter boat tracking better. They’re less fatiguing over long distances but also heavier and more expensive. It’s possible, with many kayaks, to add a light trolling motor for the long hauls. 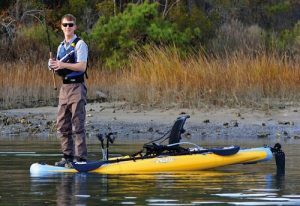 All but two of the kayaks we review below are paddle propelled, the only pedal systems being part of the nicest models. 8. Portability – Long, heavy boats will be more difficult to store and transport, especially if carrying them on a roof rack rather than on a trailer. The more carrying handles that come on a boat, the better. Two is typical for cheaper kayaks, while higher-end models have four or more. I’ve never kayaked before. Can I fish from a kayak? Anyone can fish from a kayak. Even the cheapest rod with the cheapest reel cast from the cheapest kayak will get you out on the water, and that’s what matters. Fishing kayaks are made in all sizes, so no matter your size, there’s sure to be one (or many) that fits you. It’s unlikely that you’ll capsize if you remember to keep your head down the midline of your boat, but if you’re going more than swimming distance from shore, it’s still smart to learn how to get back, just in case. Go for a swim with your boat in a lake, pond, pool, whatever you can, and get to know how to flip it back over and get back in. A SOK will drain automatically. Tip: when you’re in the water, flip the boat back over from the end, not the side. See here for how to do it. Okay, you should learn how to swim before kayak fishing. In the meantime, try wading from shore. Don’t big fish pull you? Yes. Enjoy the ride! Even very large fish won’t capsize your kayak if you have a feel for your boat. The cheaper models, yes, are definitely uncomfortable. But on the nicer models, the seats are basically recliners. If you can sit comfortably in a lawn chair, you won’t find these seats any different. They’re made for all-day outings. Where do you put the fish you catch? Catch and release is a common practice, so often fishermen put them straight back in the water, moving the fish back and forth to push water through the gills and revive the fish. You can also easily take a small cooler with ice for preserving your dinner, or you can put the fish you catch on a stringer and hang them in the water. Disclaimer: fish you put on a stringer might not be there the next time you look. Should I buy a tandem? There’s a saying when buying a boat that you should buy one for 95% of the conditions you’ll face, rather than the rare exceptions. Unless you have a devoted fishing partner who will always, always go with you and can’t or won’t pilot their own boat, we recommend a single, or two. If you want to teach a child how to fish, then a tandem might be the right choice. 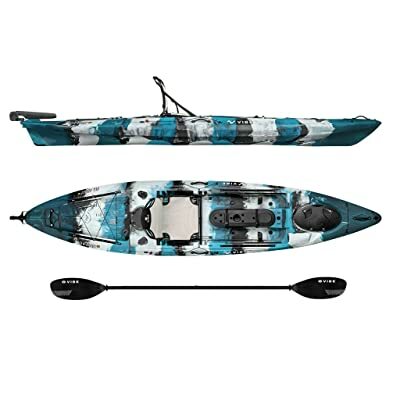 How can I test a kayak I’m interested in? Ask your local paddle shop about demo days. Comparing kayaks side-by-side will help you get a feel for what you want. Don’t forget your fishing rod! Apart from demo days, try a local paddle club (see link below); members may allow you to try out their boats. There’s no better way to learn than by doing. If possible, ask a friend to take you out on the water. The internet is also a great resource; there’s so much to be learned from reading and asking questions on forums like this one. Are there other options than the ones reviewed here? Yes. If none of the above boats fit the bill, ask people who know kayak fishing, either on the internet or in person. On forums, provide your height, weight, fishing style (or desired fishing style), and other pertinent information like limited storage space. People will be more than happy to help you. Kayak fishermen are happy people, because they go kayaking all the time! Don’t overlook the value of going to your local boat shop. They’ll know what kind of fish are in your area, where to go for them, what you need to catch them, and special considerations for your area that will be tougher to find on the internet. If you don’t have a local shop, contact a paddle club in your area. Check out this website to find a paddle club in your area of the U.S. Unless you’re a professional fisherman or a very advanced amateur, one of the cheap or intermediate kayaks reviewed above will fit your needs. A test paddle (or pedal) should tell you a bit about what will work for you. A width of 33 versus 31 inches doesn’t matter if the narrower one feels more stable to you; the feel is what’s going to keep you happy time after time out there on the water. Now get out there and catch some fish! I can honestly say that I have never seen anyone fish from a kayak like these. I can imagine they are great for getting to the one place you want to get to without having to tow around a boat trailer. Pretty sweet! I really like the FAQ section at the bottom of your website. If you are not getting the right amount of information from what you have posted, that is always an option and it could answer some very important questions people like to ask before buying. I have a friend that uses a fishing kayak on the big Lake Michigan and he swears by it. At first, I was not feeling the same way, but then I gave it a try and I could NOT believe the amount of control that I had when inside one. The “check price and Amazon rating” option amazed me. The whole write up is very much information with real facts. The Kayak lovers like me will love this website. Wow what a great write up I always find that comparison table are the best way to review a prodduct once you have narrowed it down to one or two! Thanks to Sammy for sharing much more exclusive information about the best fishing kayak. Personally, I prefer to Feelfree Moken 12.5. Feelfree Moken 12.5 is a Great kayak!!! It’s Molded in handles, wheel in the keel, stability, seat, uni track system, milk crate keepers. Paddle holders are a little rear but I don’t mind it. The front hatch can be accessed while on the water because it’s so stable. I can stand bow before the front hatch to make a dismount onto land. The hatch between your legs is deep enough for an extra reel, rod holder, and small tackle boxes. Great tone of writing. I love it. Hope others people also love to read it. Keep rocking!!! I am coming to Oak Ridge in September. I would like to fly fish the local river there. Can you recommend a local guide service for the area. I personally like sit on tops. They are just that much more comfortable. To each their own though. Thanks for the detailed guide. Never tried kayaking, but wanna do next summer.